As someone interested in writing screenplays, I was more than ecstatic when I heard about the release of Trumbo this fall. For those of you who are not familiar with the film, Trumbo is a biopic about Dalton Trumbo, a screenwriter who was part of the Hollywood 10. He was blacklisted during the 50’s for his communist beliefs, yet he was still able to win 2 Academy Awards by writing under a pseudonym. Trumbo covers a dark time in Hollywood history, where many within the filmmaking industry betrayed one another in order to make sure they would not end up on the blacklist themselves. Being on the blacklist was so detrimental because for a period of about 15 years, anyone that was blacklisted would not be hired, because large numbers of people would boycott anything related to communism, therefore causing studios to lose money. This period in film history changed the course of the industry for a long time, yet the events surrounding the period are not known to a majority of Americans today, as many were either too young or not alive when the Red Scare crippled American beliefs. Thankfully, Trumbo is here to educate the audience on this topic through the help of a marvelous cast, lead by Bryan Cranston (who was featured on Celluloid Cinema recently). Coincidently, the film accomplishes the goals it set out to obtain because of its writing. In a time when screenplays are being written as if the audience has a 15 second attention span or cannot understand character development without explicitly calling it out, Trumbo goes the opposite route, and in doing so educates its audience. Recently, Hollywood has abandoned filmmaking as a storytelling medium, and instead, is used to show off long-winded special effects sequences. There was a time when the majority of a film was spent building up characters, so that when the film reached its climax, the audience would be rewarded with an intense action sequence that actually meant something to the plot. However, over the last decade, films have started to slowly shift away from this model, and today we are left with very minimal character development. Instead of showing the audience how characters feel through dialogue or actions over the course of a scene, films will feature characters that just flat out say what they feel, so more action can be shoehorned in. This model of filmmaking does not allow the audience to take away any critical analysis of the film because there is simply not any substance to the film. With Trumbo, we see this model flipped upside down. There is not a single action sequence in the film. Every scene is devoted to character development that actually allows the audience to feel just how impactful the blacklist was to the lives of those that were on it. These characterizing scenes were not simply characters saying, “I am sad” or “I am angry”, which is normally passed off as characterization in action films. Instead, each scene gradually shows the audience how the actions and thoughts of Dalton Trumbo shifted as he dealt with the events that surrounded his life. There was no need for Trumbo to outright say how he felt because the audience was able to understand him as a character, since so many scenes were devoted to character growth and helping the audience understand who he was. This method of filmmaking allows the film to have substance that the audience can take in and formulate new thoughts around. Other than actually having a well-structured story, the real reason Trumbo was successful came from its primary goal of teaching the audience, rather than lying to them for entertainment value. There were many points within the story, such as when Trumbo attended Communist rallies or went to jail, where the writer could have manipulated the events of his life, in order to make the story more exciting or suspenseful. Yet, if this were done, it would have taken away from the credibility of the film. In keeping the film grounded in reality, the audience was able to learn the facts that surrounded the Hollywood Blacklist of the 50’s, instead of being treated to another fictionalized story of a persecuted central character that narrowly escapes death all of the time. The result of this choice is that the audience understands that what they are being told is true, allowing them to relate to the characters in the film easily because they see them as real people instead of fictitious creations. In conclusion, Trumbo is definitely a must-see film. The way in which the writer approaches the film provides a breath of fresh air for an audience that has been mistreated by writers in recent years. 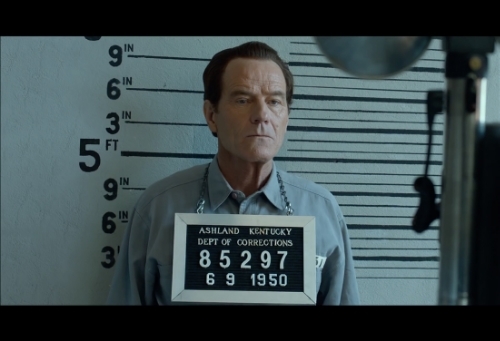 In addition, even though it was not discussed in depth, Bryan Cranston delivers yet another brilliant performance, which I believe warrants a nomination from the Academy. While Trumbo executes its goals, it is not necessarily groundbreaking in terms of filmmaking. Therefore Celluloid Cinema awards the film 4 out of 5 Reels. Thank you for visiting Celluloid Cinema. Please leave your thoughts of the film in the polls and comments below. How many Reels do you give Trumbo?